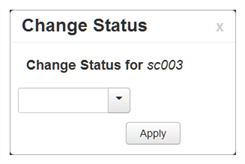 To change a scene's status, the approval policy must be set to Manual. You can also create customized approval stages that reflect the approval process in your production environment—see About Jobs in WebCC. Users who have limited rights in WebCC can still change the status of a scene, as long as it is a scene that is assigned to them. Select Scene > Change Status. Right-click and select Change Status.